Air Force and Marines Key Chain with 2 birthstone crystals - September or Sapphire and May or Emerald. All the beads and charms are .925 sterling silver or Swarovski Crystals. 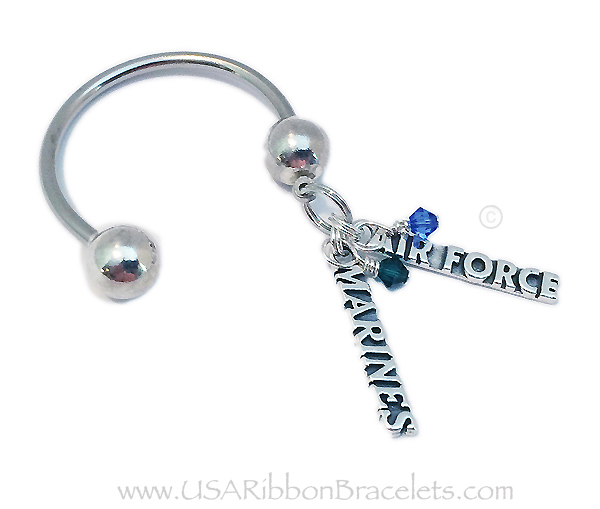 This key chain comes with 2 military branch charm (Marines and Air Force are shown) and 2 birthstone crystal dangles (Emerald or May and Sapphire or September are shown). You may add additional military branches and birthstones if you have more than 2 kids in the military or a husband/wife and children in the military. All the beads and charms are .925 sterling silver or Swarovski Crystals. Choose from these free charms: Army, Air Force, Navy, Marines, Coast Guard, National Guard, Military Mom, Military Wife, PEACE, USA, Ribbon, Heart Flag charms.